3 DAY REFRESH: WHAT IS IT?? The 3-Day Refresh is a scientifically designed program that helps you fast-track your weight loss, kick-start healthy eating, and get a clean break from bad nutrition habits. 3-Day Refresh is a simple, straightforward program that will help cleanse your body and improve the way you feel—without starving yourself. Unlike juice cleanses or liquid fasts which tend to be high in sugar and low in protein (leaving you feeling weak, hungry, and sluggish), this easy-to-follow program helps support your metabolism while nourishing your vital organs. This system really does sound like genius. People have been trying to do body cleanses even using Shakeology – and while it’s a super-healthy meal in itself, it doesn’t have everything you need to fuel your life for entire days. Enter the Refresh – it’s more than what you get with Shakeology, consisting of three daily shakes – one IS Shakeology, but the other 2 are a higher protein, higher fiber version designed to care for your body without compromising your energy, metabolism, and over all health. Each day you will also have a fiber drink, plenty of filtered water, plus a wide array of fruits, veggies, and healthy fats to keep your energy up and your metabolism going. It is a low calorie cleanse but packs a powerful punch with dense nutrition that you are getting from Shakeology, a Fiber Sweep drink, and your Vanilla Fresh Protein Shake each day. Plus you will add in fresh wholesome fruits and veggies to keep you fuller longer! It’s almost a mini version of the Ultimate Reset, which is an extensive 21 day program to completely restart your system. Here, with the addition of veggies and whole foods, you can do a mini-reset to jump start your healthy new lifestyle. 1. Wake-Up: Drink 8-12oz of filtered water. 2. Breakfast: Eat within an hour of waking. This will be your Shakeology PLUS some Fruit. 3. Mid-Morning: Drink your Fiber Sweep which is a safe, all natural digestive health drink. 4. Lunch: Drink your Vanilla Fresh which is a high-protein, hunger-satisfying shake plus options from your fruit, vegetable, and healthy fats list of foods. 5. Afternoon – Snack: Eat something from your fruit, vegetable, or juice options list. Pre-Refresh: For those who are not used to eating fresh fruits and vegetables daily, it’s recommended that you begin incorporating these foods into your daily diet (for example, a green salad each day during the week prior) and phasing out things like coffee, alcohol and animal proteins. Many will find it helpful to clear the fridge and pantry of tempting foods, so that compliance with the program is easier. During Refresh: You’ll notice shifts in your energy levels, mental clarity, your complexion changes, your cravings for certain foods may disappear, your digestion will be improved (more frequent bowel movements). Post-Refresh: You can expect improved digestion, energy, and some weight-loss. The purpose of this program is to put you on the right path towards better overall health and wellness! The 3 Day Refresh is intended to give you a break from poor eating habits and/or kick start healthy ones. After completing the program, you may feel lighter and healthier overall. 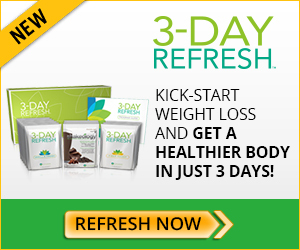 What Sets the 3-Day Refresh apart from other short term cleanse programs? superior nutritional solution and also will serve as a great door opener for purchases of Shakeology and/or the Ultimate Reset®. Ready to Get Refreshed TODAY? OR MAYBE you’re ready to start something longer term ~ daily Shakeology after you Refresh!